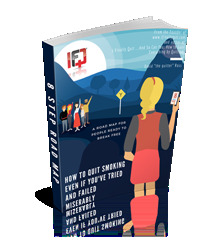 The 21 page quit smoking action plan, ready to be inserted into a 3 ring binder* then customized and completed by the user. Simply read the road map, follow the steps, fill in the blanks and you'll be on your way to quitting in no time! *3 ring binder not included. Action plan is 3 ring hole-punched.